At Ratna Ling, we self-identify as a spiritual community rooted in the principles of Buddhism. But what does that actually mean? Here are a few things that happen here that you may or may not associate with spiritual study and growth practice. We meditate together. There is something about the energy channeled during group meditation that fills a room like wisps of smoke. Deep inhales, intentional exhales, even the sound of a body as it relaxes deeper into practice can take you deeper into your own. We meditate together occasionally as a community and also in smaller groups. We have meetings. Did you ever hear the David Grady skit about conference calls? Or watch an episode of The Office? Every morning we meet together to chant and to discuss what is happening in the community. Once per month we spend a couple of hours discussing what is happening on the property, hashing out challenges, and sharing our successes. Like any group of people, we have moments that feel suited to a sketch comedy show. What we generally do not have here are crises. One advantage to living in a spiritual community that believes that being present in the moment is paramount to success is that what is really important reveals itself quickly. We chant together. As a Tibetan Buddhist community, we follow the Tibetan Lunar calendar in addition to the standard Gregorian one. This means we gather twice per month to accept the meritorious gifts offered with the rise of the New and Full moon. We chant together in a beautiful temple in Tibetan and Sanskrit. We go deep. This is something that hits me as profound every time it happens. People: men and women, discuss what it feels like to be a person when we are feeling misunderstood or stressed about a situation. It’s rare in the world to share the intimacy that is suffering (samsara) with people you’ve only just met. But why? Feelings are what makes being a human being so extraordinary. Here we are, a bunch of little miracles walking around on the earth and all we’re talking about is last night’s big game, what’s for dinner and how to get more of everything. We have Amazon Prime. Most of us are relatively new to this community and have moved here from cities or small towns without a spiritual focus. 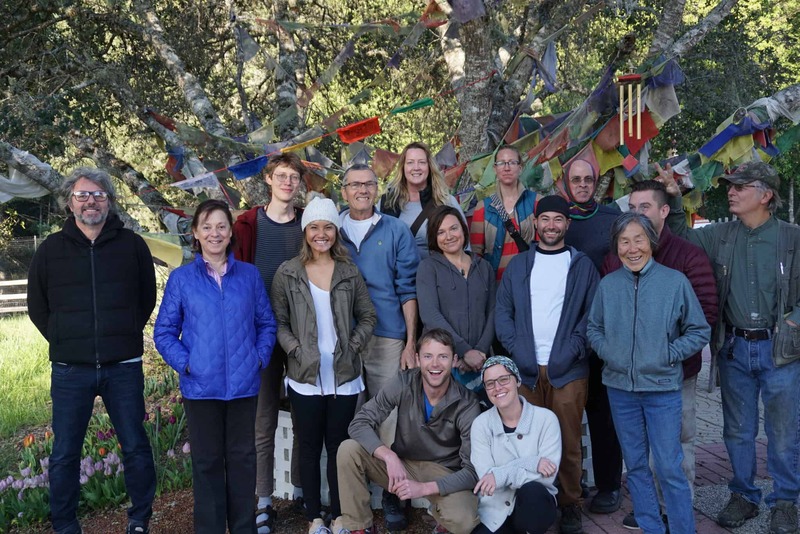 Even members who have lived here for years came into Ratna Ling with desires, conveniences and trinkets that brought us joy outside of our spiritual practices. Even though we live in a very remote location and most of our needs are met; food, shelter, water, safety, community, independence) we do have luxuries like daily mail service, some mobile phone coverage, and internet access. Living in this spiritual community does not mean we are completely cut off from the outside world. Did you know Netflix still sends DVDs in the mail? We support each other’s spiritual and personal growth. The Buddha considered the community of like-minded practitioners so important that he included it as one of the “three jewels” of Buddhism. The jewels of the community, the teacher, and the teachings work in tandem to support individual awakening. The spiritual path is a long, often strenuous and usually exhausting road. The support of a thoroughly invested community helps to establish and maintain the discipline necessary to navigate the rough patches. At Ratna Ling, we live a life that is rooted in the principles of Buddhism. Studying ancient Tibetan Buddhism is optional, and not required. At Yeshe De Text Preservation Project, we print sacred Tibetan texts that are sent to monks and laypeople around the world. At Ratna Ling Retreat Center, we invite guests to join in our spiritual practice and to experience the healing opportunities available in our mandala. Dharma Publishing has printed hundreds of books to help spread the Dharma across the western world in a way that is digestible. By living in this spiritual community, we are living the Dharma in the best way we can as individuals and collectively. Have you lived in a spiritual community? Are you curious to see if it’s for you? We’d love to hear from you! Comment below and don’t forget to Like our Facebook page to read more about volunteering at Ratna Ling.